New Zealand Health stamps were adapted from the Christmas seal system adopted by Scandinavian countries. However, it was decided to release a special stamp with a surcharge to support sanatoria or similar health projects. 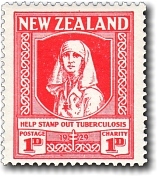 The first health stamp bears the inscription "help stamp out tuberculosis" and 1929 is inscribed around the cross of Lorraine - the emblem of the International Anti-Tuberculosis Societies. The nurse is in uniform for the period, wearing the brooch and star insignia of the New Zealand Registered Nurse Association. The nurse image was drawn by L C Mitchell and the staff of the Government Printing Office designed the stamp frame and printed the stamp. Nearly 600,000 copies of the stamp were sold.